Be the first to share your favorite memory, photo or story of Theda. This memorial page is dedicated for family, friends and future generations to celebrate the life of their loved one. 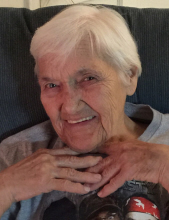 Cherryville - Mrs. Theda Heavner Beck, 83, passed away on Saturday, January 19, 2019 at Peak Resources in Cherryville. Theda was born on February 6, 1935 in Gaston County, NC a daughter of the late Charlie L. Heavner and Ila Armstrong Heavner. She was a member of First Wesleyan Church in Cherryville and worked for many years as a care giver. In addition to her parents she was preceded in death by a son Ted Sain; a daughter, Kempette Black; a sister Carolyn Jenks and an infant brother. Survivors include two daughters, Windy Davis and Chandra Heavner both of Cherryville; a sister, Rachel Dixon of Shelby; a daughter-in-law, Becky Sain; four grandchildren, Philip Sain, Trey Parrish, Dylan Wright and Teddy Tallent and three great grandchildren. Memorials may be made to the Susan G. Koman, Breast Cancer Awareness, 2316 Randolph Road, Charlotte, NC 28207. Stamey-Cherryville Funeral Home & Cremation Service is serving the family of Mrs. Beck. To plant a tree in memory of Theda Heavner Beck, please visit our Tribute Store. "Email Address" would like to share the life celebration of Theda Heavner Beck. Click on the "link" to go to share a favorite memory or leave a condolence message for the family.